The newly completed Boston Landing Station project in the Allston-Brighton neighborhood in Massachusetts is the recent recipient of the Envision® Silver Award. The project is part of a larger complex currently underway by NB Development Group, an affiliate of New Balance Athletics, Inc. In a public-private partnership that has been lauded by city and state officials alike. NB Development Group funded and managed the design and construction of the approximately $20 Million station in close collaboration with the Massachusetts Bay Transportation Authority (MBTA) and the Massachusetts Department of Transportation (MassDOT). The Envision system rates infrastructure projects across the full range of environmental, social, and economic impacts. The Boston Landing team earned credits in all five categories because of forward-thinking design by the engineering firm, STV, and sustainability commitments from Skanska, the project’s contractor. The project has especially been recognized for achievement in the Quality of Life category. The Allston-Brighton neighborhood had extensive rail and freight transportation options throughout the first half of the 20th Century, but with the construction of the Massachusetts Turnpike in the 1950s, the major rail corridor was narrowed and all its stations eliminated. With the closure of the Green “A” Branch in the late 60’s, the area was left completely out of walking distance of the Boston transit system. Boston Landing Station returns commuter rail access to a community that has not had it for over 45 years. Through close collaboration with key stakeholders, the Boston Landing Station project will have a net positive impact on the community by improving access to Downtown and increasing overall safety. The project involved a more integrated construction management process that is atypical of public transportation projects in New England. By bringing the construction team to the table earlier in the process, they were able to develop more innovative construction techniques and mitigate extensive schedule and safety risk on the project. Quality of Life: Thorough analyses conducted by the project team concluded that the Boston Landing Station will stimulate sustainable growth and development in the area and will improve quality of life for residents. The new train station will improve community attractiveness for businesses, and help the area attract a high-quality workforce. In addition, residents in the area should experience reduced commute times to Downtown Boston by nearly 20 minutes or more, depending on the schedule. The new railway platform has been designed to connect with pedestrian walkways, bike paths, bus routes, and roads. Pedestrians can easily access the station from the east or west end of the platform using a network of stairs, elevators and a pedestrian bridge. Cyclists will also be encouraged to use this station since a safe and covered bike storage area is provided. Street lighting and sidewalk improvements have been made near the station entrance to improve safety and to further encourage pedestrian use. Many safety features have been incorporated into this project, including a CCTV security system with more than 30 cameras and emergency call boxes throughout the platform, pedestrian bridge, and the bike storage area. There are call boxes near the bike storage area, safe dispersal areas, and the platform and pedestrian bridge, and the addition of these features as well as increased LED lighting throughout the station will have a net positive impact on the safety of the neighborhood. Leadership: All members of the Boston Landing Station project team have demonstrated commitment to the principles of sustainability and sustainable performance improvement. For example, NB Development Group has pursued sustainability ratings for other aspects of the larger development project, such as LEED Platinum certification for the New Balance World Headquarters. In addition, Skanska, the construction manager, has ingrained sustainability in its corporate culture by adopting a sustainable procurement policy and adopting the ISO 14001 Environmental Management System (EMS) standard. The Massachusetts Bay Transportation Authority, the project’s end-user/operator, has implemented many initiatives to reduce carbon emissions, improve energy efficiency and the use of renewable energy, as well as use resources more efficiently. 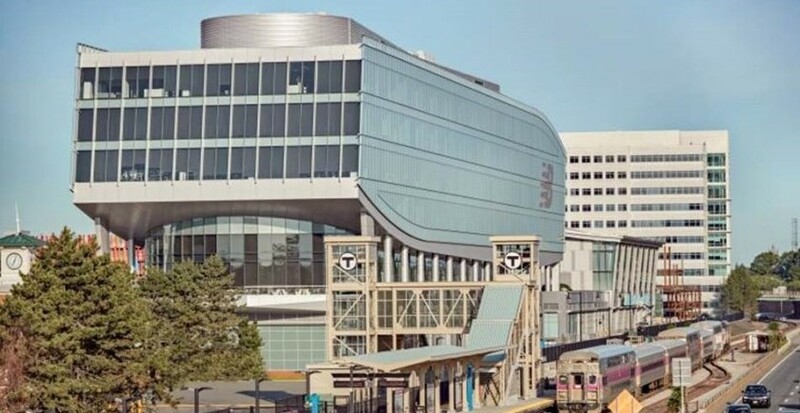 Preconstruction of the Boston Landing Station was an in-depth process in which the owner, designer, contractor, and end-user/operator were involved. The process substantially reduced project risk, and coordination among project stakeholders was improved. The contractual paradigm led to other project specific improvements such as the re-phasing of track construction and a reduction of the construction schedule, as well as the reuse and recycling of onsite materials. Resource Allocation: Just over 50% of the materials used on the Boston Landing Station include recycled content, and 95% of materials required for this project were sourced from local suppliers that are within the distance requirements included in the Envision framework. For example, the Envision framework stipulates that aggregates and sands must be sourced within 50 miles of the project site, and concrete must be sourced within 100 miles. In addition, 57% of the project’s excavated materials have been beneficially re-used on-site, reducing the transportation and environmental impacts associated with removing materials from the site.